The historic Palace Hotel (built by order of King Alfonso XIII in 1912) with its garden terrace, the fountain of Neptuno and nearby museums of Madrid – all of these provide a stunning backdrop to this recently renovated and expanded store, which was our very first coffeehouse in Spain. This location now has the distinction of being another first – it is our first LEED®-certified store in Spain. Green solutions were used throughout the renovation of the store. In its design, this coffeehouse draws inspiration from its rich history. Archways, boxed beams and paneled wainscot were used to give the space its classical feel. A light, airy color palette compliments the warm woods and spacious architecture. The countertops were made from an old wooden bench that was given a second life. The community table and leather chairs were found in an antique market and restored. Scrap leather obtained from shoe and automobile factories was used on the face of the bar. 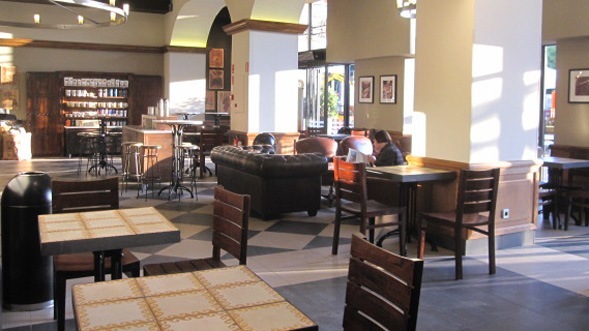 Half of the wood used to build the store was repurposed from other Starbucks stores. Of the new wood that was used, 90% is Forest Stewardship Council certified, which means it was responsibly sourced. Entrance mats were made using recycled rubber from aircraft tires. Wood, metal, cement and other waste materials were separated and recycled during construction. The mural was created using burlap bags from a Starbucks roasting facility. Efficient air conditioning equipment and LED bulbs reduced the store’s energy use by 30%. Low-flow faucets and waterless urinals reduce the store’s water use by 40%.